A Beautiful Mind is the 74th winner in this category. It was the first film that brought Ron Howard his first and only win, to date, in the Best Director category. This film proves how the Academy are fond of giving awards, especially the top prize, to biopics. I’m almost sure this film had an easy victory, although The Lord of the Rings: The Fellowship of the Ring was a major threat. In the end, the more Oscar-friendly movie won. The film starts with the promising start of the class in Princeton University. One of those young hopefuls who will become future mathematicians is John Nash, a naive if peculiar student who is looked upon for his intelligence but looked down for his undeniable awkwardness. He has a roommate, Charles Herman, who befriends him. Some years later, Pentagon hires him to crack encrypted codes mentally. The people in the job are amazed with his mental skill, but John himself find the job to be uninteresting. With this, defense personnel William Parcher approaches him with a new job, and that is to crack codes found in newspapers and magazines. In the meantime, one of his students, Alicia, takes interest on him. They fall in love and they got married. At the same time, John also met Charles’ niece Marcee, a young girl. John wants to leave his job, fearing for his life, but William forces him to stay in the job by blackmailing him. One time, John begins to think that there is conspiracy in the Harvard facility, believing that the people there are Soviets and they will just extract information from him. It is now revealed to Alicia – John has schizophrenia, and Charles, Marcee, and William, are all products of his imagination. I actually liked it more this time. And I saw the reasons why it won the top prize. But is that enough? The direction served the story quite well. There are pros and cons with the direction, so let’s take things one by one. First, the bad. The first half of the film were quite uninteresting. I know it’s mostly the screenplay’s fault (which I’d be tackling moments after this), but I know the direction could have done more. There are moments especially in Nash’s first scenes in the club when I felt that the direction isn’t trying that much to do something. Those are the parts where I felt that the screenplay was lacking, and the direction could have helped, but it actually was just giving a firm support in the process. It was consistent in the first part of the film, but I would have actually appreciated if it worked more. Some of the hallucination scenes involving the light are not really bad, but not really good, either. It’s as if I felt noting for it. It was not annoying, distracting, or ridiculous, but I also don’t think it fully worked. Of course, I understand the reason of putting those hallucinatory images – to convey the schizophrenia of the central character in an easier way. However, I was still thinking that there could have been better ways to show that. It’s as if it supposed the weaknesses of the mediocre screenplay. But those words don’t mean that the direction was bad, or mediocre. It was the reason why the second half of the film turned into an exciting and compelling emotional ride. Once it knew that the screenplay will go into cliché, it immediately catches it with bringing the execution of scenes with such energy and humanity. Actually, the whole story is clichéd, but for most part, the direction was able to solve the problem by focusing on how will the scenes come. Some scenes are just overwhelming (Nash’s shock therapy sessions and this one scene with the baby in the tub), even close to magical in effect. There are really these scenes that are intensely breathtaking that you forget what are the faults of the direction because we know that the direction is the real reason why these scenes worked. In the more dramatic scenes, it was able to inject the freshness those scenes needed in order to go away from the tiring melodrama we see in an ordinary biopic. In the scene when Alicia is trying to make John feel her what’s real and what’s not. It’s such a tender scene. It’s not even my favorite scene in the movie, but there is just some subtlety in it amidst all of these flashy hallucinations that surrounds that scene. What became the movie’s biggest weakness is the screenplay. As I have said, the first hour ranged from uninteresting to simply bland. It did not know how to build the main character efficiently. It always lets the director do most of the job even in the scenes when the screenplay was undoubtedly the most important. I can’t get past the fact that the screenplay always neglects the given events in the life of John Nash, even just the events, real or not, to actually make something out of it. Also damaged by the screenplay’s laziness are the performance in the film. Russell Crowe and Jennifer Connelly are the two biggest victims of the stupidity of this screenplay. They were supposed to have characters that we will root for. Sadly, the screenwriter have compromised this fact that they have two skilled actors to work with his script that it gave these two actors lame scenes to work with in the first part that it is just so frustrating. When the film got better, this didn’t and it was still stuck in cliché. Yes, it’s a clichéd screenplay only saved by some occasional segues from the formula, giving us at least a glimpse of what could it have been. It seemed that the screenplay was not so interested with the movie. Is it possible? I don’t know, but this movie made me feel it is. What could have been a much, much greater film is eternally damaged by a by-the-numbers and lame screenplay. And I’m not going to complain about the accuracy. The cinematography helped a lot in creating the vision of John Nash. The precision of the movement in the camera is very noticeable but not distracting in any way. You know that there is a big amount of effort given in each scene by having the cameras move gracefully when they have to, roughly when the direction asks for it, and steadily when there is rest given to us viewers. There are no fancy shots that we can see in this. There are the cameras slowly gliding when there is something revealed, the cameras are just steady when they are talking, but you can feel the grace in it; as if everything was going out so well for the cinematography. When the screenplay cannot bring out the crisp of the story, the editing immediately took over it. The editing was able to bring even the smallest interest in the scenes when the direction could be a bit lacking while the screenplay is consistent in being weak. It gave even the most boring, uninteresting, and alienating scenes in the movie the lie that it needed to make it far from being bad. Those were my words to the editing as a life-saver. In the following scenes including the shock therapy sessions, the hallucinations of Nash attacking Alicia, the revelation of Nash’s madness right before Alicia’s eyes, the editing was used to turn those scenes into pulse-pounding experiences that makes you at least forget for a short moment of time the movie committed mistakes in. All in all, the editing was very effective. The music is breathtaking. Right from the very start, that very beginning, that three logos of the company who made this film, with that amazing music from whoever the singer was – it was absorbing right from the start. When the narrative isn’t quite working well, the music is still anchoring the humane but somewhat fantastical nature of Nash’s thinking. Nash is a mathematician, and he is a genius, and the music captures just that with such amazing clarity. It brings the escalation of tension in the action-packed scenes in the film. With this, the right choice of music in the right time with the right composer for a right story brought the movie to a higher level of movie experience. The costumes served well to the purpose of the actors, bringing the defining qualities of each character with the use of even the tiniest details with their clothes. Alicia’s clothes are the most interesting pieces in he movie. Her attire when she was still Nash’s student is strongly in contrast with her clothes when she is already a housewife, though when you first look at it as it is, there is no big difference. One way or the other, the costume worked so well in creating the aura of the characters. The art direction is also accomplished in doing its best to paint the panoramic scenery of Nash’s mind. The scenes in the house are especially remarkable – it looks like a normal house in the suburb, but when you notice the very small details like the color of the wall, of the tiles, of the floor, even the way the kitchen looks like all creates the feeling of being there. And I would take note of it again – the kitchen. It felt so warm, as if I want to live there, as if it was actually real. The make-up is very good in carefully showing the aging process of the characters. The make-u, in itself, served as the transition of the timetable in the movie. It’s such a subtle work, and that is a very good sing in this kind of movie. The make-up should not be noticed. What should be noticed is the development of the characters physically. Russell Crowe’s face when he is experiencing intense attack of his illness is terrifying to watch. The actors, though damaged by the screenplay, still did well. 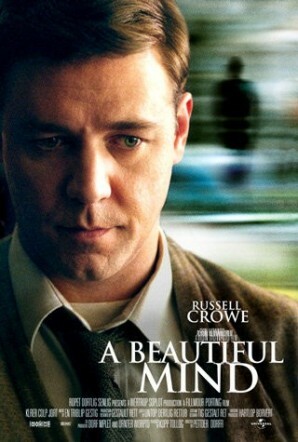 Russell Crowe is near-perfect as the schizophrenic mathematician John Nash. This is a very technical performance, not really because of the way of talking, but because of the mannerisms he employs in his depiction of the character. I can see him taking risks in his performance even if his screenplay is not demanding that much. His earlier scenes of conversation with the people while he still thinks he is doing well brings an amount of naturalism enough for me to actual;y believe that this could have been the way how Nash acted before. And I love how he handled the scenes after he was diagnosed with the mental illness. What I more like in this performance is that it never let the character suffer from the doomed screenplay. Jennifer Connelly is the biggest victim of the screenplay. Connelly is a talented actress, and I can see some shades of her acting expertise here, but the first part of the performance, like the film, was damaged by the screenplay. This time, she was not able to use her acting prowess to save her character from utter lameness. The first half of the performance, the student who takes interest with Nash, is a disappointingly lifeless creation when the screenplay has no strength, when the director is not doing enough direction, and when the actresses is limiting herself from the bounds reached by both. But the second half of her performance, now as the long-suffering wife of Nash achieved such level of greatness that you just forget her misgivings in the first parts of the movie even for just a moment. Right from the scene when she pounds the door where Nash locks himself in, the immense flow of acting skills became unstoppable. My favorite scene of hers is when she goes out to the woods where she finds out that her husband hasn’t stopped with his hallucinations yet, then the rain came,then she rescues their infant and cries “There is no one here!”. This is the moment when I felt to her character with such connection that I felt the terror that she feels for her self, for her husband, and for their child. It’s a mindblowing second half that it disappointed me a lot because what preceded greatness was dullness, and it was all in one performance. The other actors served the story well with such enthusiasm and depth but none of them really got my attention, except for those obviously grabbing the attention. In one end, I was disappointed because of that screenplay, oh, that screenplay! wasted a lot of the story’s greatness. In the same end, i saw an uninteresting first part that it may demand more attention to you. In the other end, I saw the accomplishments that are enough for a nomination in this category. In the same end, I felt an emotional impact in the second half. In the middle, I saw a movie that is made well enough to justify the nomination. This entry was posted in Best Picture 2001, Best Picture Project and tagged A Beautiful Mind by Juan Carlos Ojano. Bookmark the permalink.